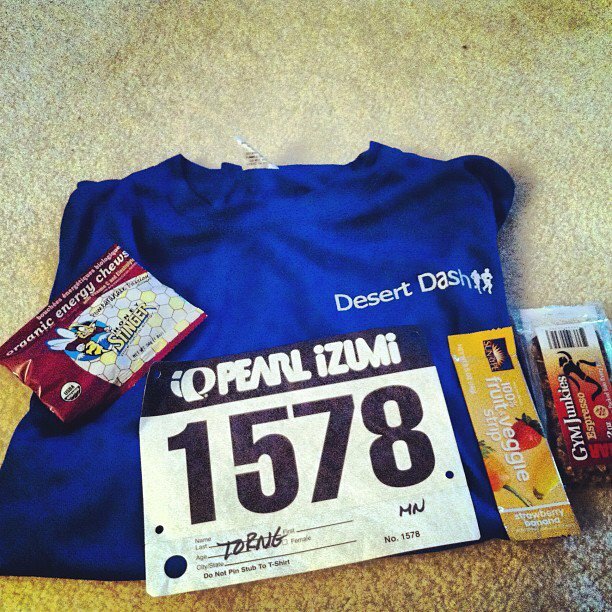 Last Saturday was the annual Desert Dash Day & Night race. I met Desert Dash a year ago when I went to Vegas for Thanksgiving and wanted to find a group to run with on trails. Someone on Twitter recommended this group so I checked them out on Facebook and met up with them during my vacation! It was awesome finding a local running group who took me on some beautiful trails in Vegas. Ever since then, I’ve kept in contact with Dana who leads the group and whenever I find myself in Vegas, I always make sure to check out what the group is up to. 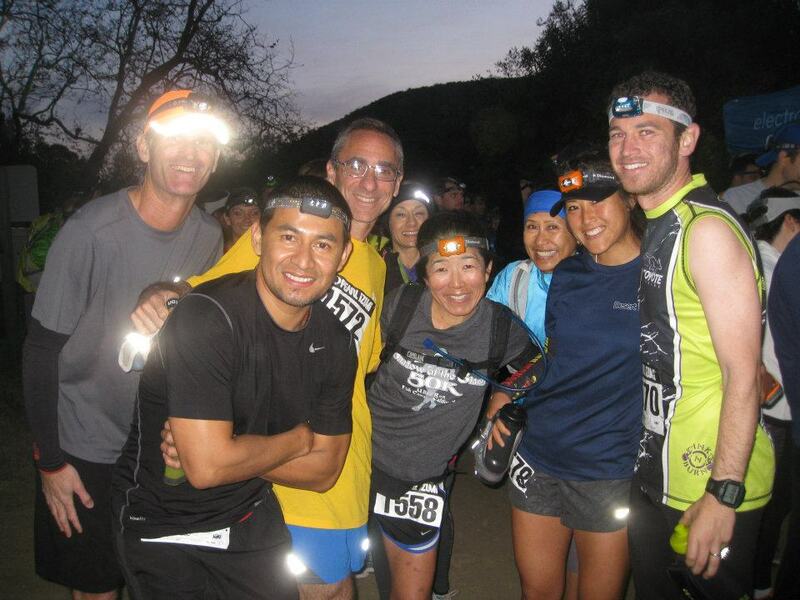 They came down last year to SoCal to run an inaugural day and night trail race at Corral Canyon. I did the day half marathon last year but opted for the night race this time around to get in some night running for Zion. 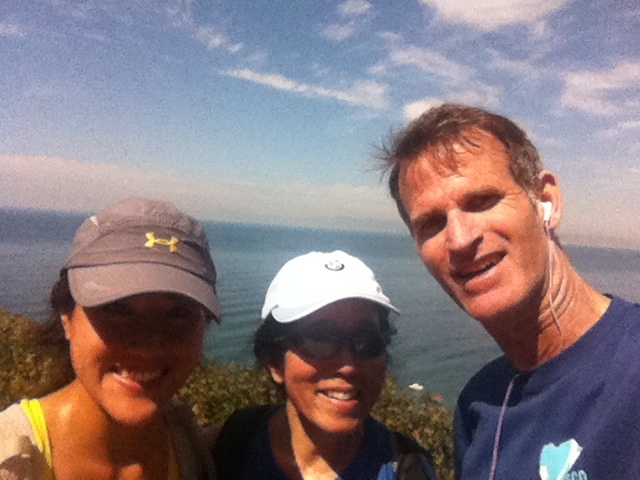 Being the crazy nut I am, I wanted to get in some mileage that day, so I ran from my place to Palos Verdes (approx 13 miles) before meeting up with friends to do the 13 mile loop around PV. 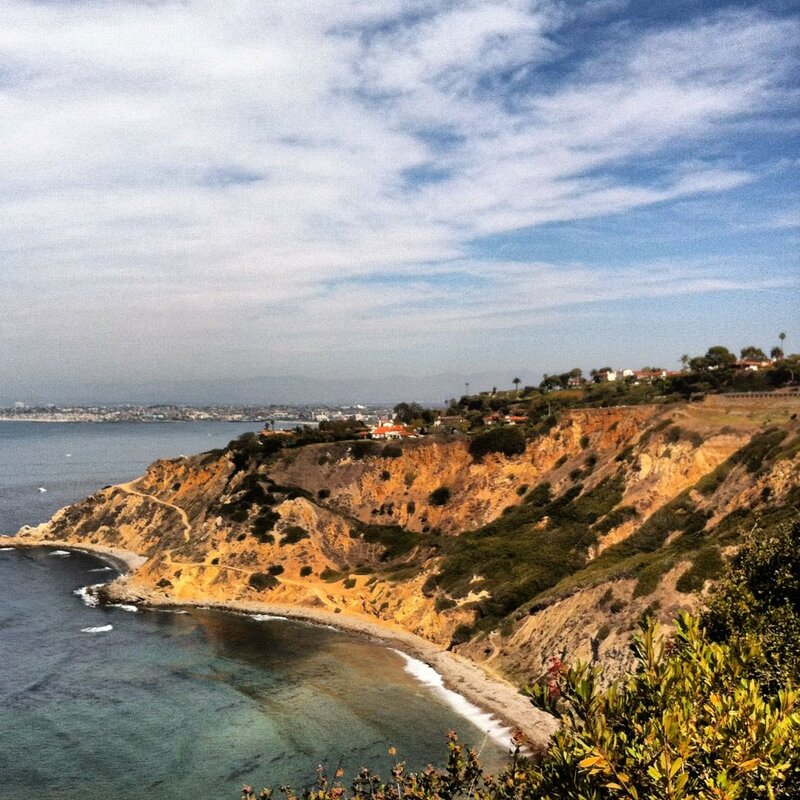 It’s hard not to love this view…It’s funny because I grew up in PV and I never ran the trails there. I actually hated running growing up, how times have changed. I was feeling pretty crummy the first 13 miles along the beach. I don’t know what it is about running flat on the beach path, but it is so boring to me. I am so fortunate to live near the ocean, but it isn’t my favorite route to run. There are too many people on the bike path either running, walking or biking to really ‘zone out’ without getting yelled at by some biker. My iPod died 2 miles in so I was left without music for the rest of the way. The 10 mile tempo run the day before probably didn’t help either as my legs and feet were tired and heavy. I put my head down and powered through it, passing by a bunch of beach cities before finally arriving in PV. I knew once I got to PV, it would be a lot better. Even though PV is hilly, the route has a mixture of wood chips, pavement and dirt and the views are always incredible. I took the loop easy and the 13 miles actually went by pretty fast. 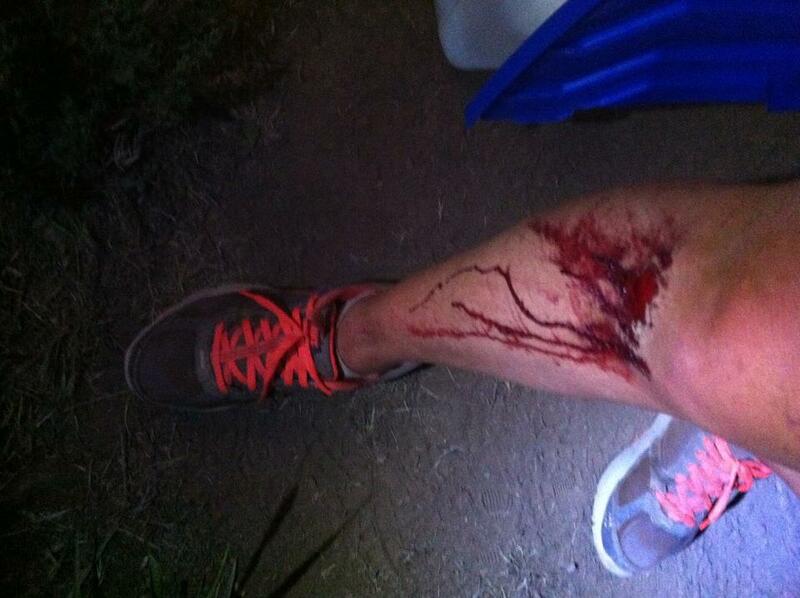 My injury decided to pay a visit the whole 26 miles getting worse and worse towards the end. I took a Tylenol, but didn’t seem to be very effective. It’s frustrating to know that even after doing all my corrective/rehab exercises that the injury is not completely gone and I’ve had it for almost 3 months now. All I can guess is that every time my mileage hits over 90 a week, my body is not happy. The last time it was really bad was at Avalon 50, and that was a 90+ week (not smart). Anyways, I never really know how my weekly mileage will turn out until Saturday which is the end of a week for me. I usually run everyday based on how I feel, so I was surprised that I hit 95 last week with a rest day on Thursday. I try for 75-80 miles to feel adequately trained for Zion, which to some might be a lot or too little. Training plans aren’t really my thing. 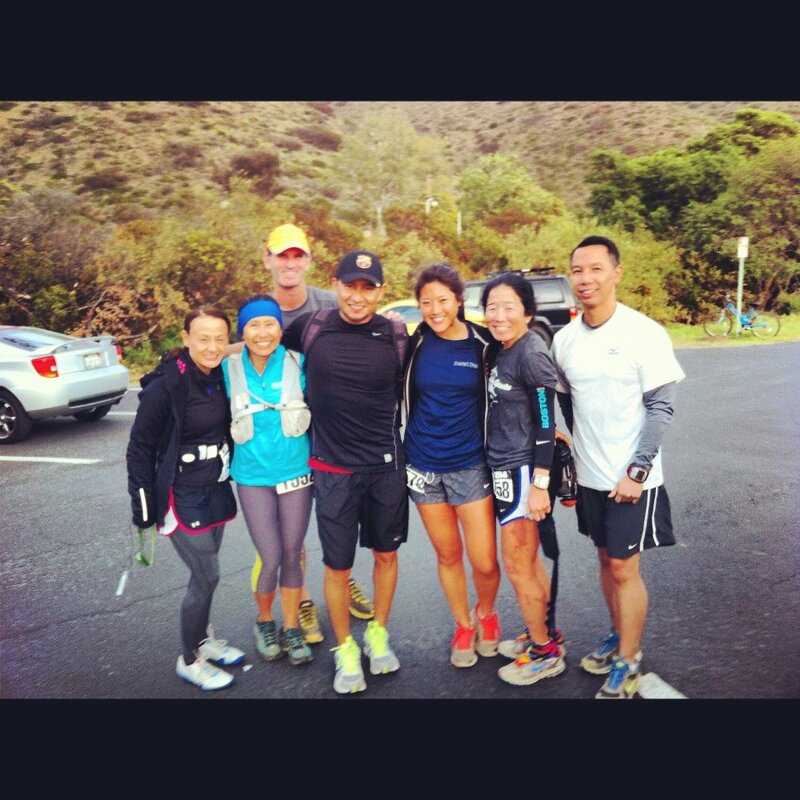 After PV, we had a couple hours to eat and shower before heading out to Malibu for the night half marathon. 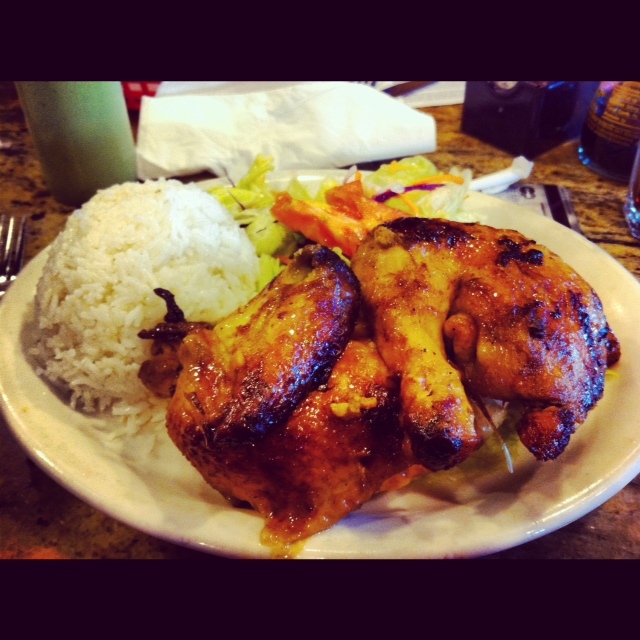 This tasted so good after 26 miles…rotisserie chicken with garlic rice at El Pollo Inka. I wanted my standard Mexican food and ice-cream before a race, but my friends weren’t into that pre-race ritual. Met up with friends and got our night running gear ready. Since this race was the day before Daylights Saving, it got dark pretty quickly after we started. The first mile was on a flat wide open fire road before turning into a rocky single track on the Serrano Trail. All these pics are from the daytime race which looked so different when running at night! Once we hit the single track, I was in trail running heaven. It was awesome just following the light from the headlamp with all the overhanging trees and greenery all around and winding in and out of a forest. We had to watch our footing though since it got pretty technical crossing over rocky stream beds. It was such an incredible sight to see little spots of light all along the trail climbing up the mountain and back down. Reminded me of Northface climbing up Bobcat trail, turning around and seeing the flood of headlamps behind me on the switchbacks. It was one of those moments where I was so happy to be out there experiencing something like this with a bunch of friends. Even though I had just run this trail during the Ray Miller 50K a couple weeks ago, everything looked so different at night. I barely recognized the trail and just kept my head down looking at the light in front of me. There’s a sense of excitement from not being able to see the whole trail and even when we were climbing, I never knew how far the climb would be. 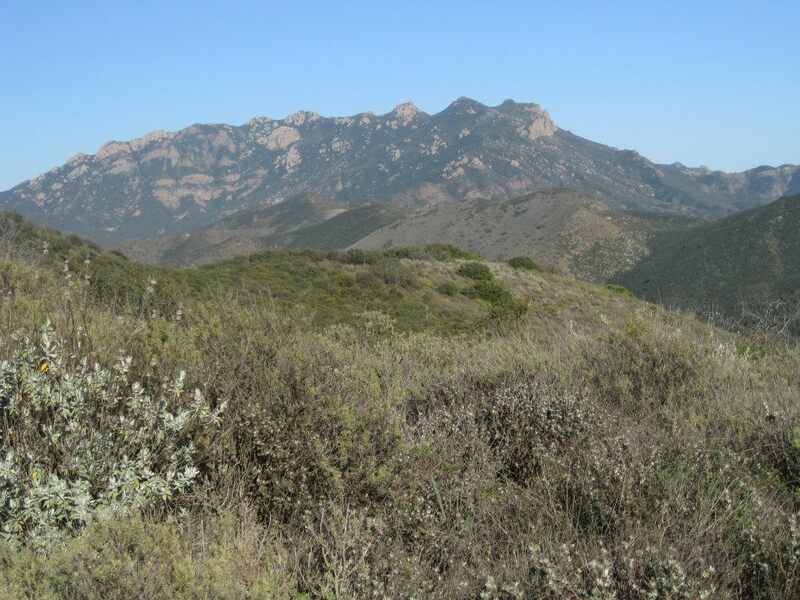 We reached Serrano Valley a couple miles in with Sandstone Peak (3,111′), the highest peak in the Santa Monica Mountains in the background. Once we started climbing, I fell back a bit and my friend Meg pulled ahead of me. I wanted to take this race easy, though my legs felt great from the morning run. I was able to run most of the uphill and once we reached a downhill, I slowed down since it was uneven footing. These two girls had been following me since the beginning and we were winding down this technical downhill when I heard them coming up from behind. They were getting closer and closer which made me nervous because they were blazing down this hill. I couldn’t believe they could run so carefree and not worry about falling. Just as I was about to pull over to let them pass, I tripped on a rock and went flying across the trail. My right knee hit the ground first, my handheld flew out of my hand and my face landed on top of the rocks all before both my hands finally hit the ground. 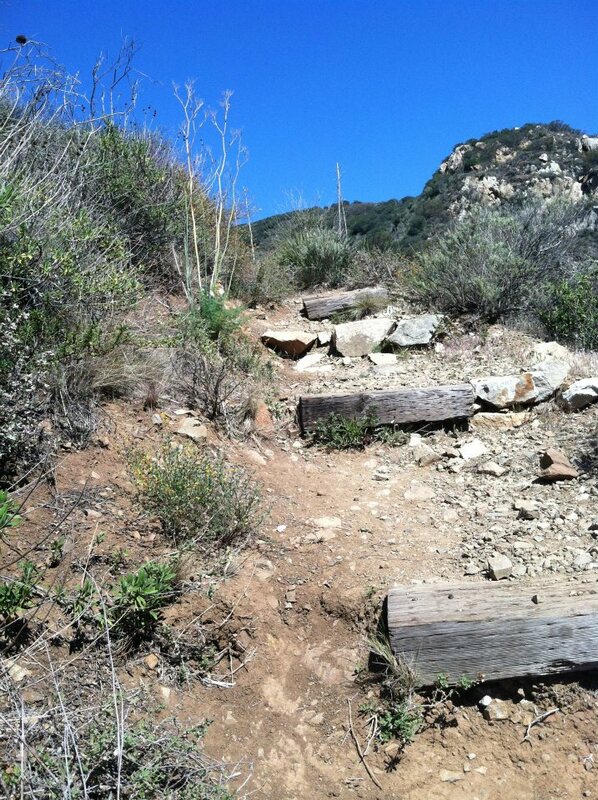 Sharp pain immediately sore through my body and I laid across the trail in shock at what had just happened. The girl behind me yelled at her friend to stop and she kept asking me if I was ok over and over again. I really couldn’t talk even though I wanted to tell her I was okay. She got worried that I wasn’t talking, but I just needed a second to gather everything that had just happened. Big fat tear drops immediately started forming and I finally found my voice to tell her I was okay. She pulled me up from behind and got me back on my feet and put me to the side of the trail. I could tell she was in a hurry so I told her I was going to be okay and she took off. I stood on the side of the trail for a bit still in shock until my friend Pete came by and saw I had fallen. The right side of my cheek hurt, but when he looked at it, he said it wasn’t bleeding. I just had a couple scratches on my knee so I didn’t think much of it. Once I got myself together, I started out on the trail again. It took a while before I felt confidant enough to pick up my speed. After the downhill, we hit Big Sycamore Canyon Fire Road along the broad valley floor. It was nice to not worry so much about my footing for the first time in the race. 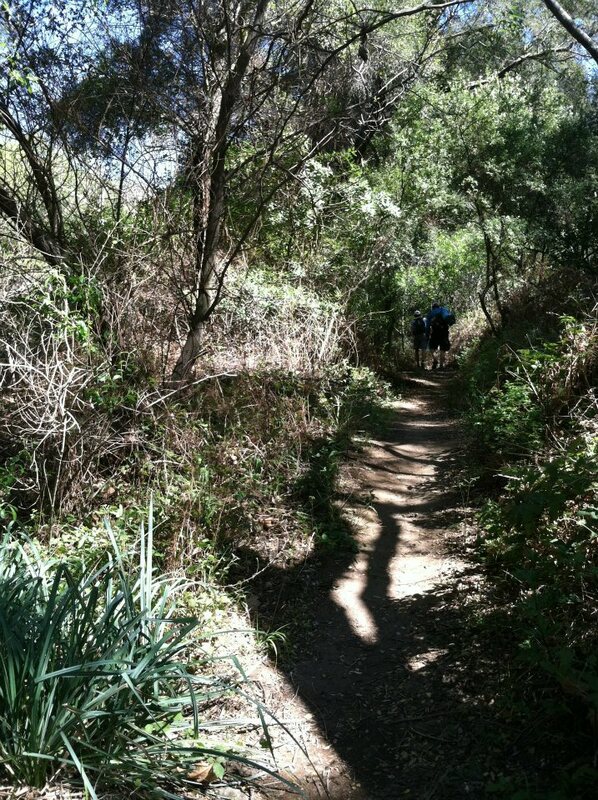 We hit our first manned aid station and headed up the Wood Canyon Vista Trail (a section of the Backbone Trail). This was our second and last major climb that gained about 720′ in 1.8 miles as the trail went up the shoulder of a ridge. It wasn’t too bad of a climb, mostly runnable. 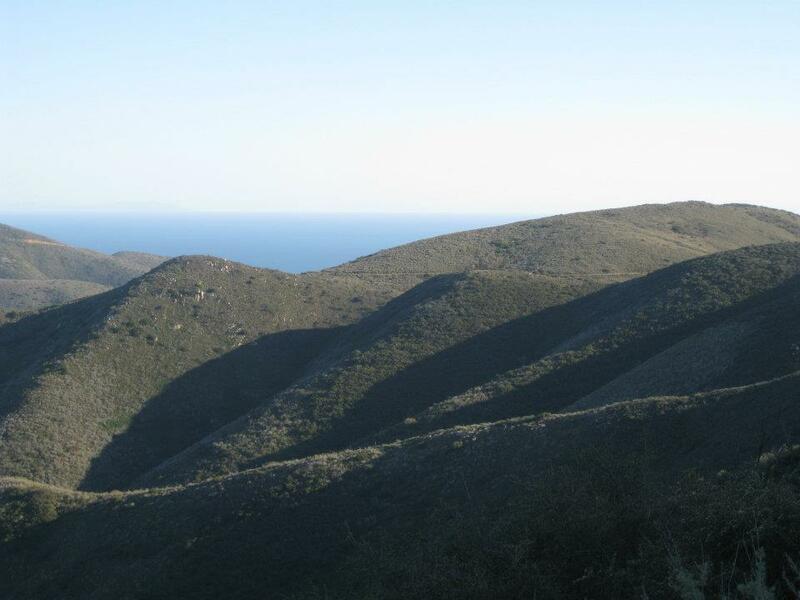 We reached the ridge line and continued up to the Overlook Fire Road which from here was all downhill as we ran down this wide fire road with views La Jolla Valley and Sycamore Canyon. I couldn’t see much around me and frankly I was too scared to keep my eyes of the trail. This was a cruising downhill so I let myself go and tried to make up some time from the fall. A mile before the finish, I randomly looked down at my leg and couldn’t believe how much blood had spilled out from the fall. 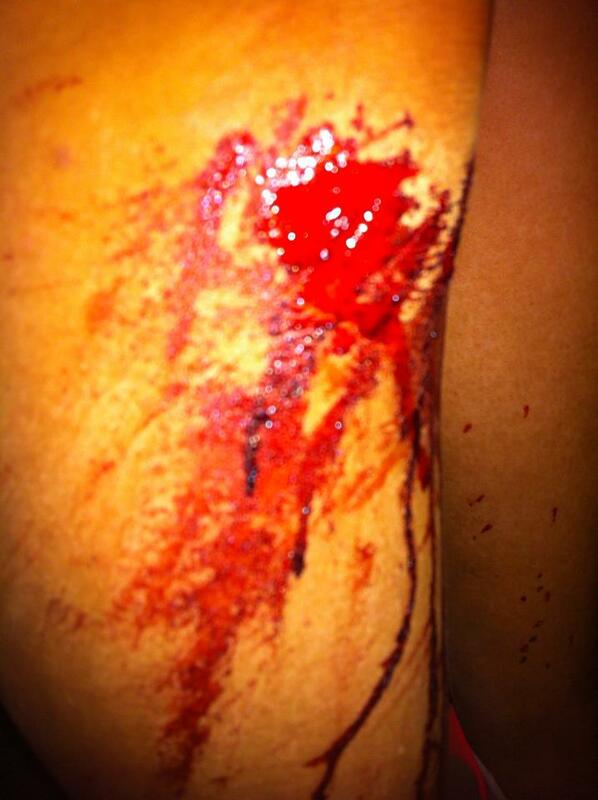 I had no idea I was bleeding that badly when I first fell. I wanted to finish fast so I could get back to the campsite and clean it up. We turned on the Scenic trail and saw that it was only a 0.7 mile downhill to the finish. 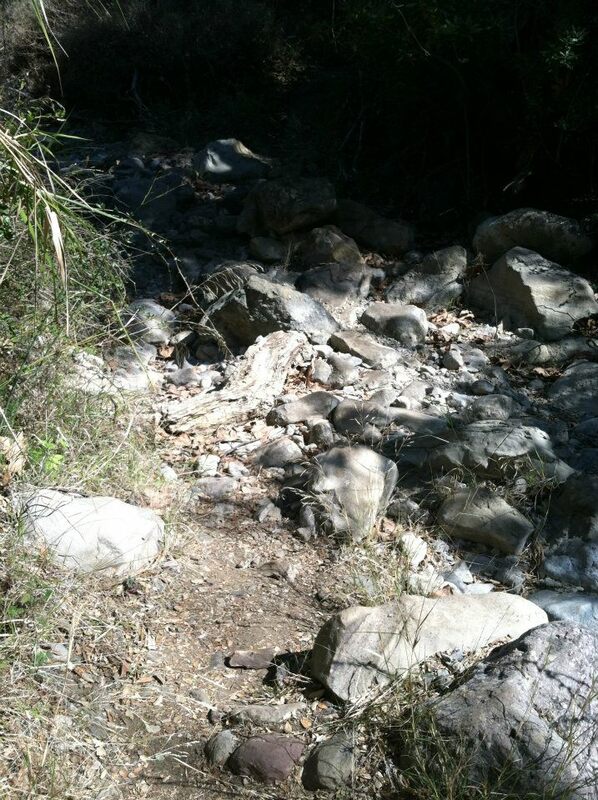 The footing got a bit tricky during this last section with rocks and steps. Not so easy to navigate in the dark, but I was lucky enough to have a guy in front of me doing all the leading. If he went down, I would know where not to step. I finished in 2:28:38 which is not amazingly fast, but given all that had happened, I’m glad I stuck it out. Ended the day with 38ish miles, not a bad training day! 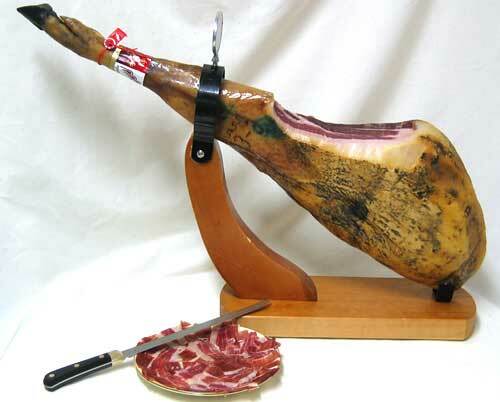 My friend Ron compared my leg to an Iberico Jamon (he just came back from Spain). Any resembelance? Great job Andee on a seriously monster of a day. Zion better watch out.